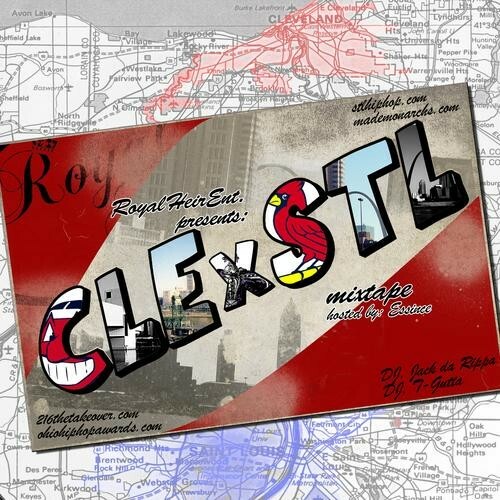 Download and Stream: A CLE X STL Hip-Hop Mixtape Presented by Royal Heir Ent. It goes without saying that this made my day, seeing as it includes my two favorite Midwest cities. Local sites stlhiphop.com and mademonarchs.com have teamed up with Cleveland websites 216thetakeover.com and ohiohiphopawards.com for an awesome mixtape featuring the hip-hop movers and shakers in each city. Presented by Royal Heir Ent. and hosted by Essince, the mix includes St. Louis artists such as Nelly, Ali, Ebony Eyez, Joka, Ruka Puff, Kemo featuring Bradd Young, Bee.Scott, Saint Orleans, Tef Poe, Rockwell Knuckles, Family Affair, Chike, Nite Owl, J Kidd, Prince Ea and Essince. (Whew.) Cleveland artists representing include (but aren't limited to) Bone Thugs-n-Harmony, Chip da Rippa and Ray Cash. You can stream and download it here, and also stream it here at stlhiphop.com.